I made nyancake! It was more difficult than I thought it would be. “In other news this week, hall thanksgiving feast. Nyancake makes its appearance. Trickier than I thought. Sprinkles did not turn out at all (too fine featured), cake should not be too moist (add flour). Bake at ~325F for ~1.5hrs, then (when brown on “top”) pull out and invert. Let cool for ten or twenty minutes, then gently shake out. 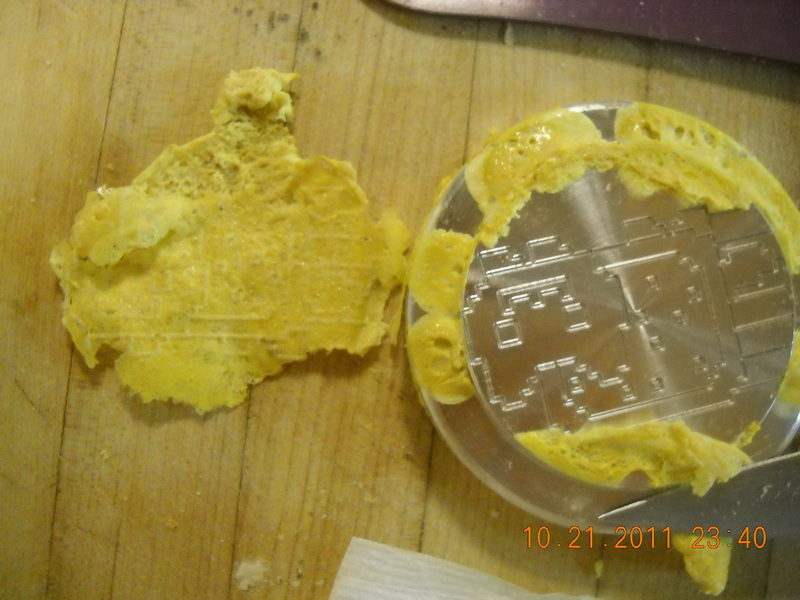 Make sure to use cooking spray as mold release!” This used $17 worth of food-grade silicone, and I just barely made it by adding a top to the mold with foam to displace the silicone where it wasn’t needed in the mold. As a whole, jello is much more recommended, but has more limited post-processing (aka adding food coloring / frosting) options. I finally managed to not eat poptarts long enough to drag them from Shaw’s, the grocery store, to the media lab shop (this has taken me 2 months, hah). 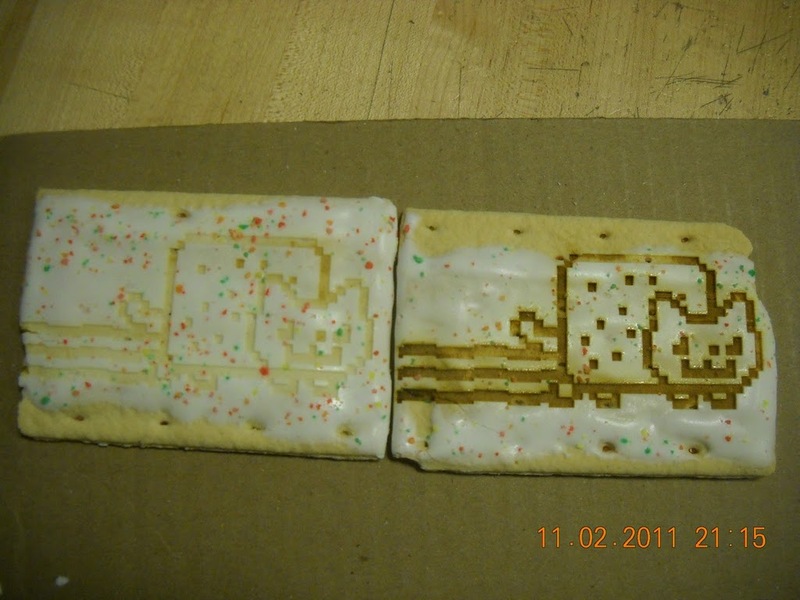 Now I have replicated the work of http://www.lvl1.org/2011/07/15/new-laser-cutter/ and created laser-etched nyancat poptarts! on the universal laser x2-600 (co2, 100w). An update from rapid-prototyping land. I have access to a shopbot and CNC mill now, which means I can now create infinity nyancats! (there was this really awkward moment in the media lab shop where these sponsor-y people walked in and looked around and took pictures. 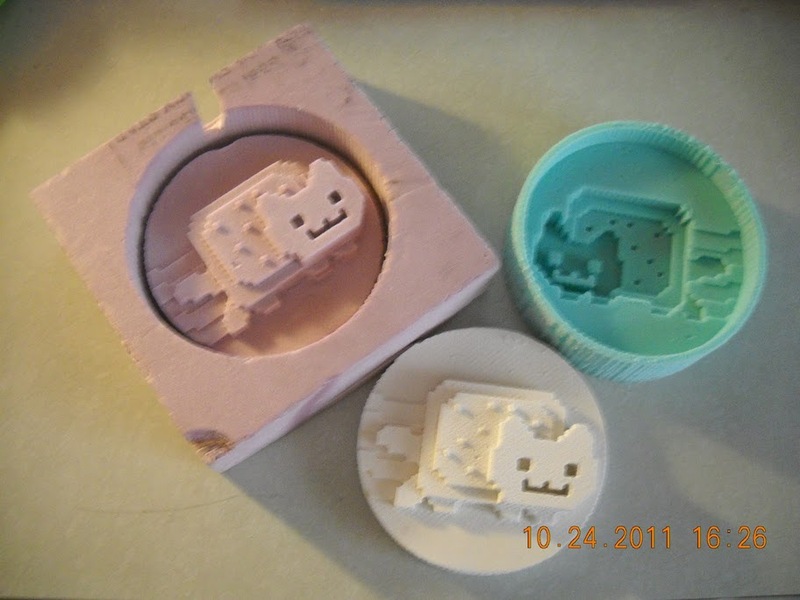 While I had nyancat on my screen and I was using this 50k shopbot 3d axis mill to … cut internet memes out of foam). Foam to smooth-on liquid silicone (in this case, mold star slow, which has a long pot time to work with — 50 mins — but takes 4 hours to cure. the quick-curing oomoo 25 was out) to drystone final (similar to plaster — a white powder, mix with water and let stand for a few hours). No release agents needed at any step, although I had to pry the silicone out of the foam, destroying the mold a bit. Final drystone version had bad surface finish due to the bad surface finishing on the foam (I was trying to cut down on my shopbot milling time) — professor suggested coating foam version in gesso next time to create a better finish. I also lost a sprinkle on the foam somewhere, and was not careful enough pouring the drystone into the silicone mold as you can tell from the uneven depth of the sprinkles. Aluminum paperweight (engraved on a CNC mill) > oomax silicone (cured in ~1hr) > drystone (cured in ~1hr) and a black smooth-on plastic (cured in 15 mins). There are tiny bubbles in the silicone version along the raised lines, probably because I needed to be more careful making sure the oomax poured all the way into the tiny etched grooves. 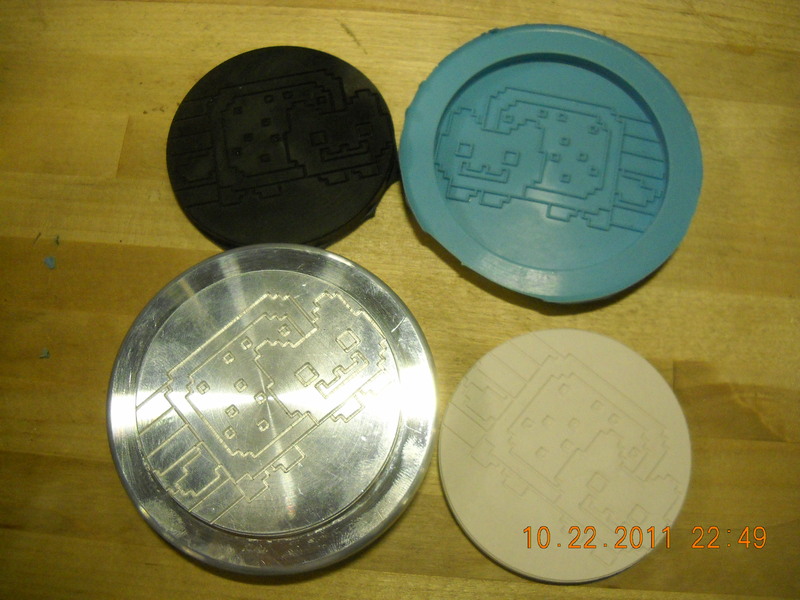 google images (nyancat) > Solidworks (3d model / dxf) > MasterCAM for the aluminum paperweight, Partworks for the shopbot foam mold. MITERS wants to give you money (“makerships”) to work on your own projects. smaller requests are more likely to be granted). and discussion (coolness / technicality will come into play here). comes to hang out at MITERS. No dancing involved [yet]. pure 6-1. We’re self-funded, so not directly tied to any department. save it elsewhere before you submit.